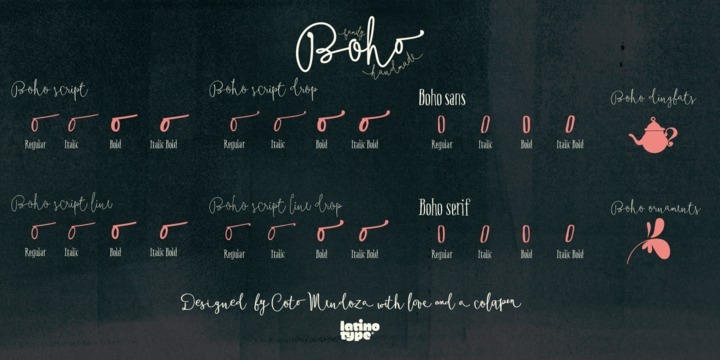 Boho is a handwritten typeface created by Guisela Mendoza and published by Latinotype that is based on gestural calligraphy with Cola pen. Inspired by a bohemian girl, this family font comes in 4 subfamilies, each with 4 weights. Also it has Dingbats and ornaments. It works great for romantic projects, fashion, magazine, headline, logo etc. A font description published on Wednesday, February 18th, 2015 in Fonts, Guisela Mendoza, Latinotype by Alexandra that has 5,301 views.